Informing customers and offering options is part of the Compliantia culture. This is why we’ve compared Excel and email to specialized retail audit software and discussed whether you should buy or build retail audit software. This is also why we compiled a list of retail audit software vendors! In this post, we discuss how to choose a retail audit software vendor, in six steps. Being a retail audit software vendor ourselves, it is arguably difficult not to be self-serving and biased. We will try to remain as neutral as possible in the general discussion while also laying out the “Compliantia way” throughout the post. What business, functional features and workflows must the software accommodate? Ask your operations, loss-prevention and/or merchandising groups (any group expected to use the data collection and retail audit software) to compile a list of needed features. Start with how you work currently and layer on features that would address today’s pain points, increase productivity, reduce risks and/or cut costs. What device(s) do you need the software to work on? Are you satisfied with mobile devices only or do you want head office and store users to also be able to use the software on PCs? The Compliantia way: The success of an in-store program, such as a merchandising campaign or health and safety audit, requires store-level participation. Audits are ineffective if the results are not shared with store management and staff and do not involve the stores, with the equipment on hand. Users and stores expect, and need to, connect with the devices they have, be it a smartphone, a tablet or a PC. Mobile-first does not mean mobile-only. Do you need support for multiple languages? Do you need to collect data in multiple languages, concurrently and run consolidated reports across languages? The Compliantia way: Compliantia supports data entry in multiple languages concurrently and consolidated reporting. Do you need to work online as well as offline? Online, aka “real time” is the fastest and easiest way to work today. But it has limitations especially in remote areas and areas where reception is poor, intermittent or lacking. 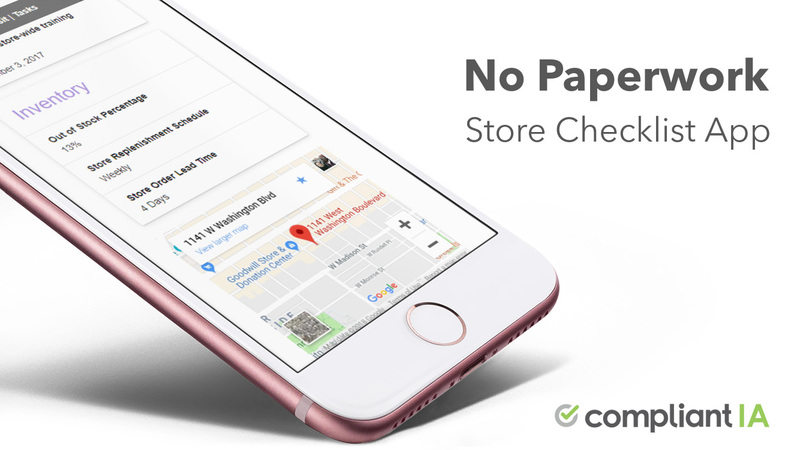 The Compliantia way: Your ability to audit stores cannot be contingent on internet reception, reliant on best-case scenarios and ideal conditions. In the real world, internet access is expected, not guaranteed. 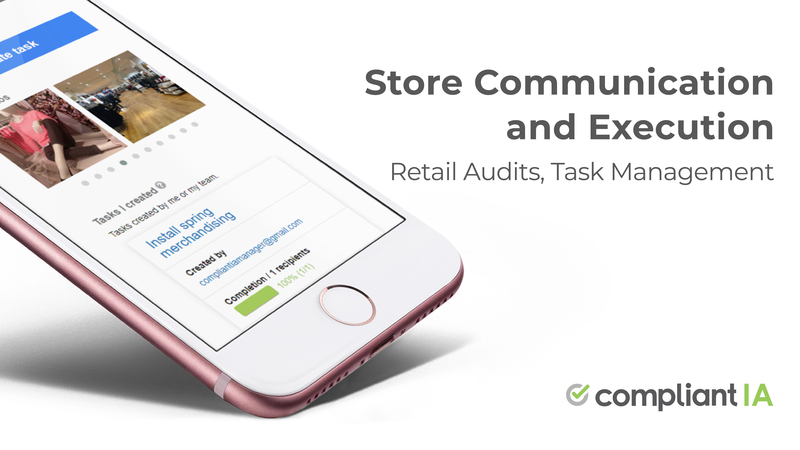 For the sake of your retail execution programs and users, make sure your retail audit and store execution software is capable of working both online and offline. Turnover in retail is high. Are you able to manage users and locations in bulk? Managing users and locations using a web-based interface is handy. It is a core requirement and near universally available. But it does not scale. If you have 1,000 or more locations and users to enter, is your retail audit software automation-ready? The Compliantia way: bulk import of locations and users, one-time and ongoing. What type of reporting do you require to support the business requirements of the data collection program? Do you need both aggregated summaries and raw data? Can you export your data and feed it to a third-party analytics engine? The Compliantia way: 27 built-in reports, both raw and aggregates. Trends, repeat unacceptable. Full export capabilities. Does the product have all must-have features? The Compliantia way: Make sure your needs are addressed, all of them! Addressing 75% of your needs with a bare-bones solution will only create frustrations and will hold you back from reaping the benefits of automation. Go with the software that does what you need today, not the software that perhaps, one day, with considerable investments, could. Is it easy to manage (and self-manage), easy to setup, easy to use? The Compliantia way: Every screen, every prompt, every function is carefully and purposefully designed, field-tested and ongoingly reviewed to be clear, intuitive and cohesive with the rest of the system. If a user can use our software without being trained, in poor lighting condition, on a small device while standing up…we have done our job. Is the company established and profitable? – Is the company established, reputable and dependable? Have you spoken with some of their customers in the same category (comparable size and store count)? – Are they profitable and financially healthy? – Is the company a “startup”, backed by venture capital? To get this information, consult https://www.crunchbase.com/ and type the vendor name. – How long have they been in business? In your estimation, will they still be in business in 5 years? The Compliantia way: Compliantia was established in 2009. It is a wholly-owned subsidiary of Betterdot Systems Inc, established in 1999. We have been profitable every year since 1999, are self-financed, have no outside investors and are debt-free. We are registered with Dun & Bradstreet. Our parent company developed Compliantia by investing profits from its software consulting practice. Compliantia has been so successful, the consulting practice was discontinued years ago to focus on the product alone. Get a quote in writing. Note and compare any and all expenses, both upfront and ongoing. Make sure you are not charged for updates to the software. Make sure the service agreement can be cancelled within a reasonable period of time with no penalties. The Compliantia way: Compliantia is quoted as an annual “all inclusive” fee. There is no setup fee, no per seat license, no hardware, software or maintenance cost or any other fee other than the annual all-inclusive fee quoted. Are you able to trial the software with your locations, users, forms and devices? Is the trial free? Is support available during the trial? The Compliantia way: We work closely with each customer during the free trial. We help you upload locations, users and forms and answer any questions you may have. You can reach us on our toll-free number or by email. What measures does the vendor take to ensure the security of your data and the reliability of the service? Ask your IT department to inspect the security measures taken by the vendor to ensure the security of your data and the reliability of the service.